I make no secret about the fact that I do not use liquid foundation and that I hate the feeling of having a bunch of product stuck on my face. I also make no secret about the fact that I love products that come in stick form. (So tired of TSA going through my bags.) So anyone probably could have guessed that I was going to buy the Match Stix from Fenty Beauty. When I went to check out, I noticed that Sephora had a code for a free sample of their Pro Filt’r Soft Matte Longwear Foundation with purchase. I figured, this is a brand that I might make a foundation exception for. My products came a couple days ago, so here are my first impressions of them. These guys are magnetized. This is cool on two fronts: first, so they don’t come uncapped in your bag and wreak havoc, and second, because they make a honeycomb and that’s pretty awesome. The product is, obviously, formed into a stick. It starts out with a rounded tip (ha ha we’re all adults here). Of course, that will change depending on how you apply the product. I bought two shades, because I was shopping online and I couldn’t tell right away which would be the best match. Would a pinker tone act as a semi-color corrector or just look stupid? Who knew? So the coverage on these sticks isn’t the greatest, and they also tend to smear away. Normally I apply concealer with whatever applicator comes with the product (like a doefoot wand or a sponge or whatever) and blend with my fingers. That super didn’t work here. What I found worked the best was the mini beautyblender, which did a decent job distributing the product without just transferring it all somewhere else. 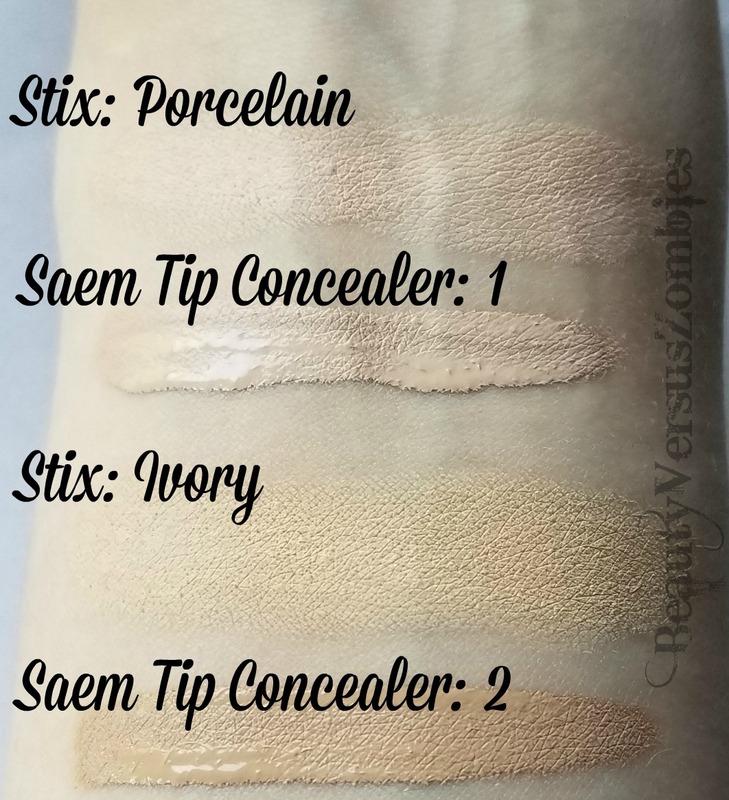 I think the thinness of the coverage would be great for folks whose dark circles don’t reach their souls like mine do, or for people who are new to contouring who want to be able to go light on the application. It just doesn’t work at all for me, and I find that a little sad. 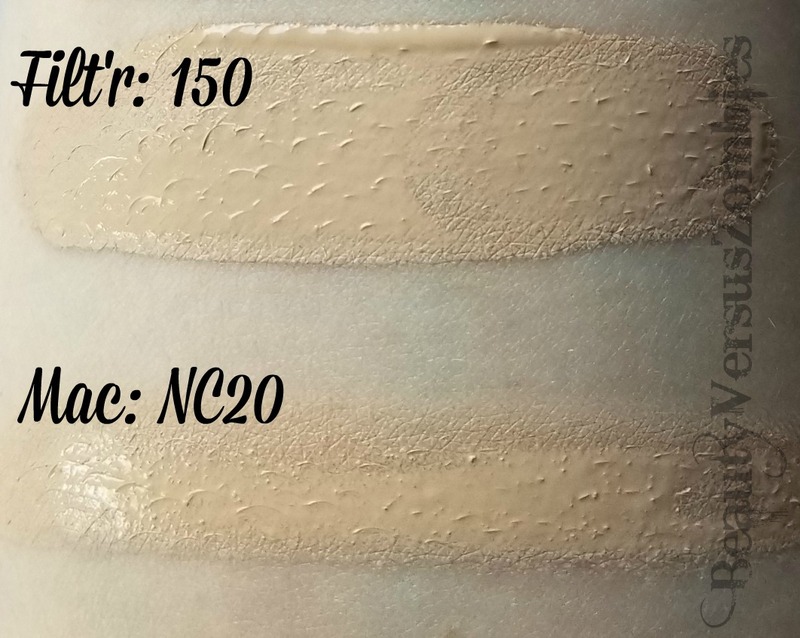 Plus, these are really similar same shades to concealer I already have in liquid form. And those were a lot cheaper and the coverage is a lot better, so… Whoops? You can purchase the Match Stix at Sephora or the Fenty Beauty website for $25 each. So, first things first: this foundation oxidizes. So you should probably buy a shade lighter than you match to on first swatch. 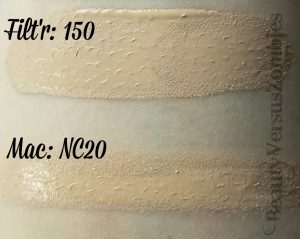 My deluxe sample came in shade 150, which ended up being a pretty decent match for an NC20 like me. I applied this foundation two ways: on one side of my face with a foundation brush, and on the other side with a beautyblender. Don’t ask me what the brush was; it came as part of a GWP set. And the beautyblender was the free mini one I got in a Sephora play box. I don’t buy foundation products other than cushions, so I’m not particularly familiar with their accoutrements. Sorry. The foundation sets fairly quickly, so you should work fast to get it around your face. I didn’t really see much of a difference between using a foundation brush and using a sponge; either way I had no trouble with patchiness or streaks. As noted in the name, this is a pretty matte, almost powder-finish foundation. It dries down very soft and doesn’t feel cakey or gross. It’s actually surprisingly comfortable to wear. In terms of coverage, I’d call this a medium. It covered the redness on my face and around my nose. It also did an okay job with my dark circles, but I would absolutely recommend a color corrector underneath the foundation first. Otherwise you’ll have a lovely shade of corpse grey under your eyes. The first time I tried this foundation, I wasn’t paying attention (watching a youtube makeup tutorial, sorry not sorry) and set my whole face with powder. In retrospect, this is what we call a poor life choice. I don’t know whether it was that powder in particular (it was an Etude House one) or powder in general but boy did that yuck things up real fast. I won’t do that again. Unfortunately, like the Match Stix, I didn’t really love this foundation. I wasn’t expecting to, but for very different reasons. While this foundation is phenomenally comfy to wear, it emphasizes all of the texture issues on my skin and after about an hour it looks cakey as hell. After my one-hour makeup check, I went to bother my roommate (she’s always my “Does my face look weird?” reference). She said, “You look kinda dead. Also, you look like you are Wearing Makeup.” (The capital letters were implicit in her tone. I always look like I am wearing makeup, because I am always wearing makeup.) We then had a short discussion about the fact that I looked like I ran face-first into a Power Puff Girl who then exploded. My takeaway from that conversation (and the fact that I looked at my face in the mirror beforehand) was that this is definitely not a foundation for me. If you’re only looking to color-correct and you’re okay with looking like you are wearing a face full of foundation, this product might work for you. If you want to try it out, you can get it at Sephora or at the Fenty Beauty website for $34. Long story short? 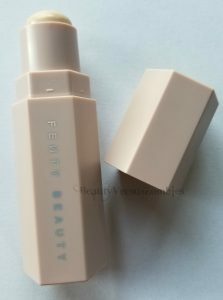 I really, really wanted to love Fenty Beauty, but these products just don’t do it for me. Have you tried them? Did you have a different experience? 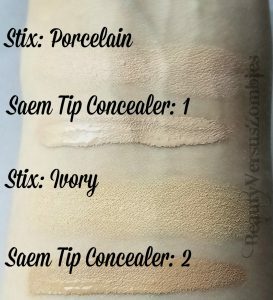 This entry was posted in concealer, Fenty Beauty, foundation and tagged first impression, makeup, Stick it to Me by BeautyVersusZombies. Bookmark the permalink.